And today, I thought I would share with you a small and mundane element from the everyday French office life. A food-related element, that goes without saying. In France, the set of laws that governs the work environment, le code du travail, forbids you to eat in the rooms where you work (ahem — no, I don’t know how those crumbs got into my keyboard, did they maybe chip off from the ceiling?). But if enough employees wish to eat in their workplace, the employer must provide a way for them to do so under safe and healthy conditions. He can either furnish a room with chairs, tables, a fridge and a microwave, or he can give them access to a cafeteria (usually operated by large catering companies), or he can give them lunch vouchers to use in nearby restaurants. 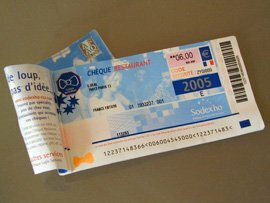 Such vouchers are called chèques-repas, chèques-déjeuner or titres-restaurant, but are most often referred to as tickets resto. You get a little checkbook at the beginning of the month, with one voucher for each day that you will work. Their value is co-financed by you and your employer, usually on a 50/50 basis, which means that if your ticket resto has a 6€ face value, it costs you 3€ (deducted from your paycheck) while your boss pays for the other 3€. 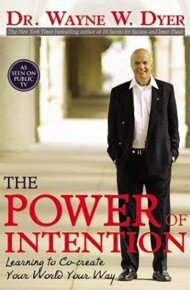 The incentive is that the whole thing is tax-deductible for the employer as for the employee. Of course, the higher the face value of your tickets restos, the bigger the perk, and it’s one of many ways to judge how well a company treats its employees. 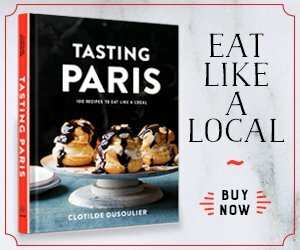 Most restaurants in France will display a little sticker on their door to indicate that they accept those vouchers, provided they are open for lunch and are interested in catering to the office crowd. If you’re not sure you can just go ahead and ask — “Vous prenez les tickets resto?” — but be warned that some mid- or upscale restaurants will look at you with contempt and scoff: “On n’est pas chez Flunch“*, as I was once told at a restaurant where they thought good food could make up for obnoxious service. * Flunch is a French chain of cafeterias, often found in malls. On a Saturday morning, you go to the pool for your weekly swim. 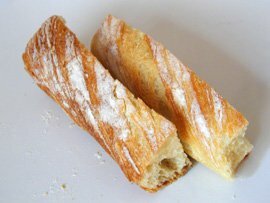 As you come out, limbs pleasantly weary and hair still wet, you reflect that it would be nice to buy a baguette for lunch. So, instead of making a right and walking directly home — you are fortunate enough to live just a block from a clean and quiet swimming-pool — you go left and make a detour by the boulangerie to buy a warm and crusty Renaissance baguette (their signature traditional baguette). As you walk back up the street, you pass the fish stall, and the thought pops: bulots! That will be great for lunch. 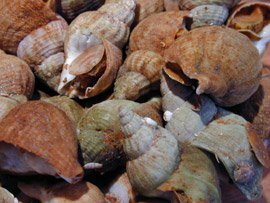 Bulots — also called buccin, ran, coucou or cuter still, calicoco — are whelks, those pretty snail-like shellfish that you eat cooked, after delicately removing the little opening cap and pulling the chewy body out, optionally using a special metal pick. In Paris they can be purchased, already cooked, from any poissonnerie — and each fish stall cooks them to its own recipe. Relatively cheap, super nutritious (they are full of vitamins and minerals) but more importantly, delightfully tasty and fun to eat. You step in to enquire whether they have any, and the poissonnier says yes — in fact he has just finished cooking the daily batch and they are still warm. You buy a generous portion for two that he gets from the back. All right, all right! Obviously, resistance is futile: I have been tapped — twice! — in the Music in My Kitchen game that’s been going around our little world of food blogs. I usually try to keep things more or less focused on the edible around here, but since my kitchen is a “cuisine à l’américaine” that opens onto the living-room where the hi-fi gear is, musical ambiance is an important aspect of my cooking life. So here goes. 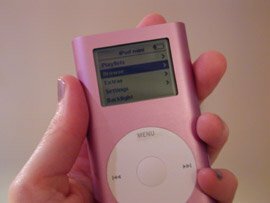 I have very few files directly on my iBook: most of my music lives on the mp3 server that Maxence has set up, from which our stereo reads via a cool wi-fi device. Um, wait: is this getting too geeky for the general public? Nolita, Keren Ann‘s latest album. The next one I will buy (I know you didn’t ask, but whose blog is this?) 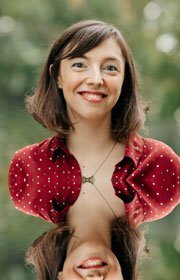 is likely to be Coralie Clément’s new album Bye Bye Beauté: it comes out on Monday and I’m going to her concert on Thursday night, so I’m going to have to act fast! Over breakfast this morning, I had a sudden craving for Arte, a song by the Spanish group Nosoträsh (on the album Popemas). We discovered Nosoträsh a few summers ago, as our friends Nathalie and Damon were visiting from San Francisco. Nathalie, who works in the music industry and therefore has very sharp tastes, knew about this group and about the mini-concert they were giving that night on a péniche called Le Batofar, a bar/disco barge on the Seine. So we all went, and we spent the evening drinking mojitos and listening to the Spanish girls sing. A soft, slightly melancholy (although of course I speak no Spanish and have no idea what the lyrics say), beautiful song. 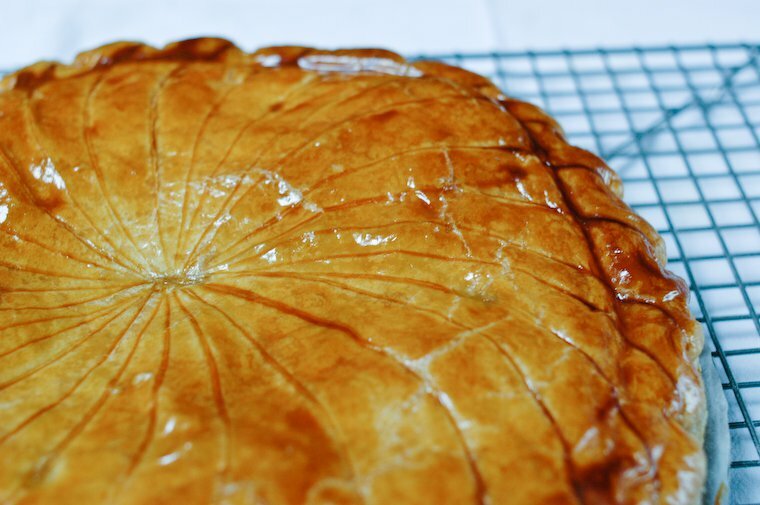 Are you looking for a homemade galette des rois recipe? Like many a Christian holiday, this one has lost its religious significance in most French families, gaining a sweeter, much more buttery one in the bargain: on the day of the Epiphany, families share a Galette des Rois, a flaked pastry pie filled with frangipane, a butter-rich, smooth mixture of crème d’amande (almond cream) and crème pâtissière (pastry cream)*. The fabulous thing about a Galette des Rois, apart from its deliciousness, is the family ritual that goes with it: the youngest child of the family hides under the table, an adult divides the galette in even slices, and the child calls out which slice goes to whom. Why all the fuss you ask? Aah, it is just this small thing I haven’t yet mentioned: la fève is hidden in the galette. Historically a dry fava bean (hence the name), it is now a little porcelain figure. (That figure used to have some kind of religious meaning but that, too, has gone the way of the dodo.) Whoever gets the fève in his serving is named King (or Queen) for the day, gets to wear the golden paper crown that came with the galette, picks who the Queen (or King) will be, and glows with pride for weeks hence.